A shape that has become a symbol of progress and innovation, a floating blimp attracts attention and captivates our imaginations. While these examples are really "moored-balloons" without propulsion, the symbolism remains the same. Why spend thousands on short-term billboard advertising when a one-time purchase can buy a giant inflatable display that you own for life? 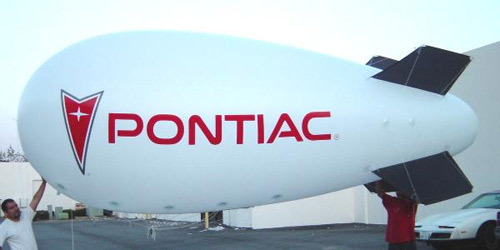 Tie one of these graceful blimps to your roof and have your message visible for miles around. Advertise a special event or just make potential customers notice your business as they whiz by in their cars. A portable and reusable display than can be ready to fly in minutes. Since laws do not permit shipment of helium tanks, it is the only component that you will need to supply locally, everything else you'll need is included in the kit. Helium tank delivery is easy to set up with one phone call and is widely available in most areas. These nylon blimps are available in 20', 24' and 30' lengths. The nylon material is three layers thick, making it the strongest inflatable blimp of this size on the market. An outer urethane coating provides UV protection while an inner urethane coating achieves superior helium retention. Ideal for fairs, trade shows, festivals and sales events. Artwork is digitally applied using a flexible urethane based paint that will not peel or wrinkle. See pricing below. Ideal for outdoor use, these giant blimps will withstand wind gusts of 30 - 40 MPH. These nylon blimps come as a complete kit, all you need is the helium. 1W-BLMP20-NYLON 20' Nylon Blimp & Kit $1,690.00 $1,995.00 $2,095.00 $2,350.00 $2,980.00 750 c.f. 14 lbs. 28 lbs. 1W-BLMP24-NYLON 24' Nylon Blimp & Kit $2,200.00 $2,495.00 $2,595.00 $2,985.00 $3,920.00 1100 c.f. 20 lbs. 32 lbs. 1W-BLMP30-NYLON 30' Nylon Blimp & Kit $2,995.00 $3,395.00 $3,495.00 $4,250.00 $5,260.00 1800 c.f. 28 lbs. 46 lbs.